On July 17, 2018, about 80 people gathered in the empty ground floor retail space of the Richmond BART parking garage to witness an important turning point for Downtown Richmond: the groundbreaking ceremony for the Richmond Business Hub. Residents, community leaders, project partners, local businesses, and elected officials mingled while enjoying Red Bay Coffee, pastry, and fresh fruit. 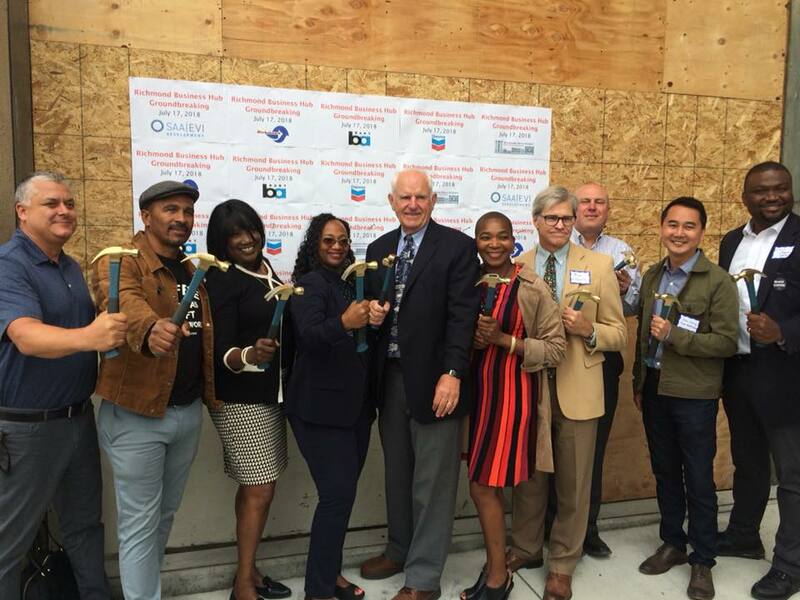 Representatives from the project’s partners–the City of Richmond, BART, Richmond Main Street, Chevron, and SAA/EVI–spoke about the development, the collaborative effort behind it, and the positive impact that it will have on the neighborhood. The two part project will fill this nearly 10,000 square foot space with a food hall and CoBiz Richmond, a coworking and business incubator. The food hall, located near the 16th Street side of the space, will feature anchor tenants–Red Bay Coffee and Locol–and pop-up vendors operating out of shipping containers, a communal dining area, and outdoor seating. CoBiz Richmond, an eQuip Richmond project developed in partnership between Richmond Main Street Initiative, Richmond Chamber of Commerce, and Renaissance Entrepreneurship Center, will be the largest tenant in the space and will serve the needs of the small business, entrepreneur, and freelance creative workforce in Richmond, North Richmond, and surrounding areas. The short program was followed with a unique groundbreaking ceremony: key project partners gathered outside to officially kick off construction by hammering the first nails into place.